Aalayam - Colors, Cuisines and Cultures Inspired! : Saffron, Sankranthi....and loads of Sweets! Saffron, Sankranthi....and loads of Sweets! It's the first post of 2014! And I am privileged to be bringing it to you. And this post is full of festive inspiration (Sankranthi is round the corner!..read about our last year's Sankranthi celebrations here!) some spicerack remedies (remember my series?) and some very mouth watering pictures! I am getting ready for the first Hindu festival of the year – signifying the Harvest Bounty of agrarian India. And as I plan my sweet dish menu, I look fondly at my favorite “rich-man’s spice” – Saffron!! This spice is sure to go into the Gulab Jamoons and Besan Laddus I am making for Sankranthi. So, while I am at it, I figured, I’d rhapsodize a little about the history and trivia related to Saffron…and Sankranthi!! And of course, share some images from my kitchen! “Saffron”, the royal spice derived from a flower called “Crocus”, widely used in a variety of cuisines as a seasoning and a coloring agent. The spice is actually the dried stigma of the crocus flowers, really expensive and regally exclusive! You would think that a spice that magically makes an unborn child “fairer” while in the mother’s womb, has to be pricey? No? ;) Trust me, I'd been advised to drink buckets of warm milk with saffron during my pregnancy, to ensure that my twin girls were born with "fair" complexions!. India's obsession with "fair" skin continues right? Saffron has been historically used as an aphrodisiac, mood elevator, ritually offered to divinities, and used in dyes, perfumes, medicines, and body washes. No surprise that, Persian saffron infusions, are used in baths as a curative for battle wounds! The active components in Saffron have many therapeutic applications in many traditional medicines as antiseptic, antidepressant, anti-oxidant, digestive, anti-convulsant. Saffron's aroma is reminiscent of metallic honey with grassy or hay-like notes, while its taste is sweet. Saffron is widely used in Indian, Persian, European, Arab, and Turkish cuisines. (Read Kashmiri Biryani, Milanese Risotto and French Bouillabaisse!) Confectioneries and liquors also often include Saffron to add a double note to the discerning palate. Now, Makara Sankranti is an important Hindu festival celebrated with religious fervor in almost all parts of India. The festival is celebrated to mark the beginning of the bountiful harvest season after few months of chilly winter. It falls on January 14, every year, as per the Solar calendar. Makara Sankranti is also known as Pongal. There, it is a three-day festival, starting from January 13 until January 15. January 13 is celebrated as Bhogi, followed by Makara Pongal (Sankranti) and then culminated by Mattu or Kanuma Pongal on the next day. The customs followed in villages of India, on Makar Sankranti, have a unique charm. Sakkare Acchu or Sugar Candy in fun shapes! I have had the privilege of growing up in a Kannada household, but with mixed heritage flowing in from both Tamil and Telugu customs. Courtyards swept and sprinkled with water, and Rangoli (floor design via chalk powder) drawn and decorated with Cow Dung dumplings (Gubbame), is a fun (yes!!!) Telugu custom, while the Tamil custom of preparation of Pongal (rice and lentil pudding) overflowing from the cauldrons in which they are prepared, definitely has yummy outcomes! This festival is a direct symbolism of people extending their gratitude to Mother Nature for good harvest and prosperity. Sankranthi is also called Suggi or harvest festival for farmers of Kaveri basin of Karnataka. On this auspicious day, young females (kids and teenagers) wear new clothes to visit near and dear ones with a Sankranti offering in a platter, and exchange the same with other families. This ritual is called "Ellu Birodhu." Here the platter would normally contain "Ellu" (white sesame seeds) mixed with fried groundnuts, neatly cut dry coconut and fine cut bella (jaggery). The mixture is called "Ellu-Bella" (ಎಳ್ಳು ಬೆಲ್ಲ). The plate also contains sugar candy moulds of various shapes (Sakkare Acchu, ಸಕ್ಕರೆ ಅಚ್ಚು) with a piece of sugarcane. There is a saying in Kannada "ellu bella thindu olle maathadi" which translates to 'eat the mixture of sesame seeds and jaggery and speak only good.' This festival signifies the harvest of the season, since sugarcane is predominant in these parts. Gulab Jamoon reigns supreme on festive occasions...sprinkled liberally with saffron strands! In some parts of Karnataka, a newly married woman is required to give away bananas for a period of five years to other married women (muthaidhe) from the first year of her marriage, and increase the number of bananas in multiples of five. There is also a tradition of some households giving away red berries "Yalchi Kai" along with the above. I remember, sitting down in a long brown sofa with all my girl cousins in my grandmother's house, and get showered with the yalchi kai (stinky that they were!) symbolizing the shower of prosperity on the womenfolk!! Post the shower, we used to collect coins (dakshine) from the stinky shower that had dispersed on the floor...and in the folds of our langa blouses.. and sit and feast on the Sakkare Acchu and he jaggery parts (only!) of the Yellu Bella mixture. In North Karnataka, kite flying with community members is also a tradition. 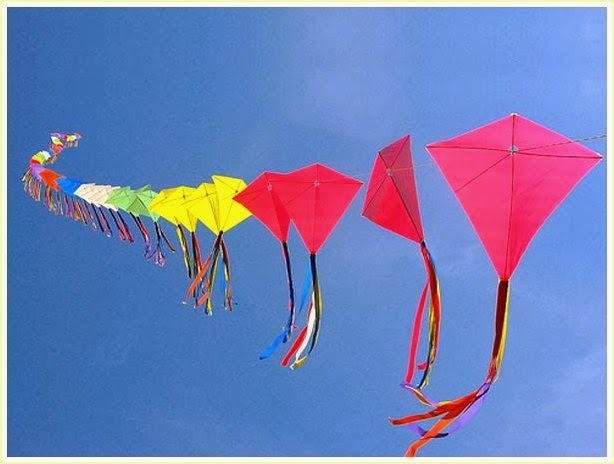 Colorful kites of all shapes and sizes fly in the blue January skies in parts of Maharashtra and Andhra Pradesh, signifying the farmers' delight at the good weather. Besan Laddu anyone? Don't miss the saffron strands, adding the special flavor!! Isn’t it amazing? The cornucopia of culture, customs and rituals our Indian festivals are full of? And the calendar is just beginning for 2014! I feel so fortunate, that I am able to chronicle my experiences for my kids to read, cherish and follow. I am not sure if I will get a chance to sit with my girl cousins again on that brown sofa…and get showered by Yalchi Kai..but I sure will try to get my kids and their lot together to follow the same tradition in the years to come! What is your favorite family tradition surrounding Sankranthi? Do you make the Yellu Bella mixture? Or do you make Pongal - Sweet and Khara? Do tell..!! Who knows, I might just drop by to “Yellu Beeru” at your place soon! Pratibha - thank you. Festivals are the fabric that hold our memories together somehow! I agree with Prathibha. Brought back such sweet memories. All the festivities before and after marriage. You bet Calindgirl. What are the specialties of the festival in your heritage? You are from South India too right? .. those besan laddos... OMG .. no you should no have put that picture :P... amazing pictures always..!! The kesar and kites would be my favs... :)) happy festivities..
:) Shaz!! Festivals are a time for indulgence aren't they? Supriya,lovely article! Sankranti to me is the fresh "maavina torana" on the main door, colourful "Rangoli" at the entrance (with women taking extra effort to draw sugarcanes on either side of their design :-)) sweet pongal, khara pongal, the "elchi kai" shower, those cute funny boxes with "jeerge peppermint" that goes along with the Yellu beero items,and the list goes on !! In our household, the "elchi kai" shower for kids is done in "paavu or seru" along with coins and diced sugarcane. We also have this custom of "Kusri kaalu sara" (chain made out of sugar candy beads) that kids are made to wear on Sankranti while the women of the house do " Kempu Aarti" to ward off evil influence on the kids. It is customary for the newly married bride to wear black saree on her first Sankranti in certain households. Most of all, Sankranti to me is the time to visit friends and relatives for "yellu beerodu" ,and eating "yellu" to my heart's content!! Advance Sankranti wishes to you Supriya! Brinda!! That was eloquent. Thank you for your traverse down the memory lane. I love the Rangolis during this season. Don't forget the pots of pongal design!!! We should invite you to do a guest post sometime on Aalayam. I really dig your writing style!